Should I friend my new church members? In many church systems, there’s pastoral change each year: pastors retire, pastors move from their church to replace them, pastors move to replace those pastors…it’s a chain of transitions. 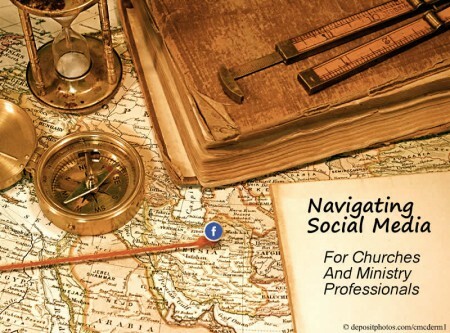 In the age of social media, how do pastors need to operate differently? Our previous post in this Guide dealt with a touchy question in the digital age that pastors agonize over: when I leave a church, do I need to unfriend my church members? (see first post) Now for the second question: Should I accept friend requests from church members? Is there a way to separate public and private Facebook usage? Thankfully, you are reading this page. 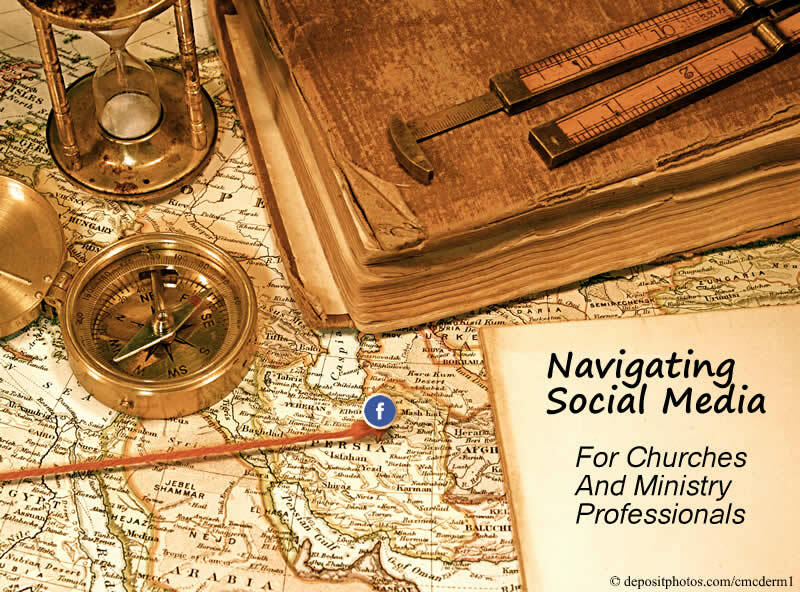 This is the Fourth Edition of our Facebook Guide for Pastors in Transition, and we have a tried-and-true method for you or your pastor to do social media engagement with your new (or current) church better. Some folks have two Facebook accounts: one professional, one personal. I see all the time “Jane Smith” and “Pastor Jane Smith” accounts on Facebook and honestly it’s annoying (and a violation of FB rules). Hacking Christianity has always focused on integrity: being the same person online that you are in your real-life pastoral ministry. Having two Facebook accounts doesn’t work for this pastor and thankfully Facebook gives you the tools to not need to. By using the three tools of Friend Lists, Privacy Settings, and Post Privacy, pastors can use one account with varying levels of access, allowing for private discussion and public inspiration from one account. This is the way how I have used Facebook for seven years without any incidents and you can too. There’s a simple three-step process to categorize your new church members and how to categorize your future contacts. All of the below are PRIVATE actions, meaning no one knows anything about your friends lists and post privacy. NOTE: all steps are assuming you are interfacing with Facebook on a desktop/laptop. I do not have instructions for iOS/Android/mobile as the interfaces are different and often the options I’m using are missing. 1. Make a Friends List. 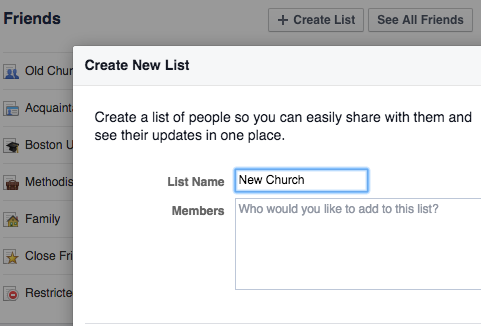 Go to this page on Facebook and click “Add New List.” Name it your new church name/location. Add parishioners that you’ve already friended from your new church to this list and click save. You can always add to it later. 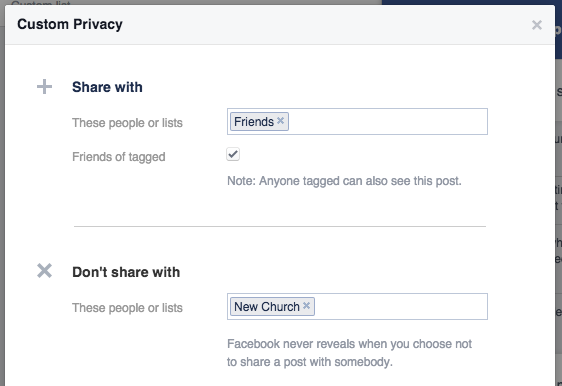 Under “Don’t share this with…”, type in your new church’s list name and it should come up. Click on it, and save changes. 3. Add future friends to this list. 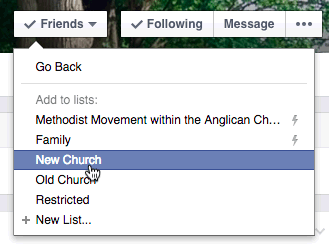 Whenever you accept a friend request, or make a friend request, you can hover over their “Friends” button and select a list to add them to (click “more” if you don’t see your New Church list). Select it, look for the check mark, and you are done! Wait. What did I just do? This process allows you to post updates (posts and pictures) on Facebook without interaction by your church members by default. You are still connected to them and can interact with their updates. If you change your profile picture, your church members can still comment. But by and large, your posts will not show up on their timelines unless you interact with their timeline posts and pictures. That way parishioners see and experience your engagement on their cat pictures while you keep your cat pictures private. 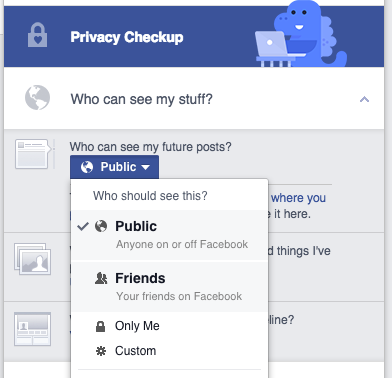 Now you can change the privacy settings on each post. On every post, you see the gear icon? You can click it and make it public, friends only, or custom depending on the content. That way you can post inspiration for everyone (including people who “follow” you), or change it to be private away from church members’ eyes. Just a note: changes are perpetual so you might shift each update, but it’s really customizable. Why would a pastor hide their posts? You don’t tell obnoxious jokes in front of grandma. You speak differently to your family than to your church. You speak differently to your bishop than your secretary. We all have different voices depending on context–not different personalities or personas, but different voices. By making Facebook into lists like this, you are able to keep your voice consistent for the various people groups, while lessening the chances of people not “hearing” you correctly. For me, my entire social media life is played out in public. I publicly moderate the almost 5,000 member UM Clergy Facebook group. My Twitter, Pinterest, Google+, Instagram, and Blog are all public. So I appreciate having one service where I can choose who reads my thoughts, private fears, concerns, and heartfelt family stuff. Mastered the above? Here’s a few quick tips for pastors that will help them manage digital transitions. Create a page. I have a Facebook page for my blog and I use that to point people to. That way, they can follow it and control how much they want to interact with it, not me. This divides the personal/professional easily for me. Even though Facebook has degraded the reach of Pages, by maintaining engagement of your audience, the Pages do pretty well. Create a group. All posts in groups are seen by other members, unless they are blocking one another. So you can create a group for your church and add them all to it, and then you have a public or private group with which to interact. Decide carefully whether to actively friend church members. I don’t tend to actively “friend” church members on Facebook. I don’t like to be the person who is “in” people’s lives if they don’t want it. And then what if they reject it and then it’s awkward? Was it me? Was it something I said? Was it my t-shirt? Is there something going on with them? Needless to say, it sends me back to the drama of middle school, so that’s why I don’t tend to friend people and wait instead to be friended. Your process may vary. thank you so much for again sharing this guide. I am sharing it with my UCC colleagues to consider as part of our boundary training. Do you have any similar insights or guide for other social media platforms (ie Twitter)? I have found it less complicated to “unfriend” everyone but staff and let them know they can “re-friend” me after 6 months. I facebook everyone what I am doing before I do it. This way, I only have those people who truly want to continue a relationship with me. It also allows me to gracefully get rid of challenging relationships with minimal fallout. This process was especially helpful when leaving a toxic congregation where I could not distinquish between friend and enemy. By doing this, I am able to keep my friends list more manageable. However, I would recommend your method as the minimum requirement. Thank you for sharing it. Regarding having both a personal and a professional facebook account, for me, it is not about being a different person, it is about being a good steward of my time. I manage multiple facebook pages from my professional account, which is part of work time. I do not log on to my personal page during my regular work hours. I do not check my professional page during Sabbath time. I also use my professional page to participate in facebook groups whose topics are minsitry related. While this works best for me, I do wish there were a way to honor the terms of service. Seminary Education is Dangerous for Pulpits?